April 8, 2019 -- With incredible agility, 52-year-old Phurchung rushes through the creeks and rubble on the Changtang grasslands 5,000 meters above sea level, watching over the "golden treasure". He heads one of 73 management stations across the Changtang National Nature Reserve, covering an area of 298,000 square kilometers in the northern Tibet autonomous region. The nature reserve is the biggest and highest in China, and is home to a variety of wildlife species. Among these, the golden wild yak is perhaps the rarest. An adult golden yak weighs over 1 metric ton. Unlike its dark brown cousins, it is truly a magnificent animal with its lion-like fur. There are only around 200 of them on earth, and all of them are found here. The golden beast first showed up in travel notes a century ago, but it was not until 1987 that biologists were convinced they actually existed. Phurchung was born in a nearby village and became a wilderness ranger in the 1990s. He earns 2,000 yuan ($300) a month, with a living allowance of 300 yuan. Unlike his ancestors who worshipped the yak in cliff paintings scattered all over the grassland, Phurchung now roams the reserve to protect them. "I traveled much faster when I was younger," he said. "With binoculars, a motorbike and a few supplies, I could cover hundreds of kilometers a day." Over a few decades, Phurchung has come to patrol every corner of the reserve. "I know the names of every snow mountain and every lake," he said. 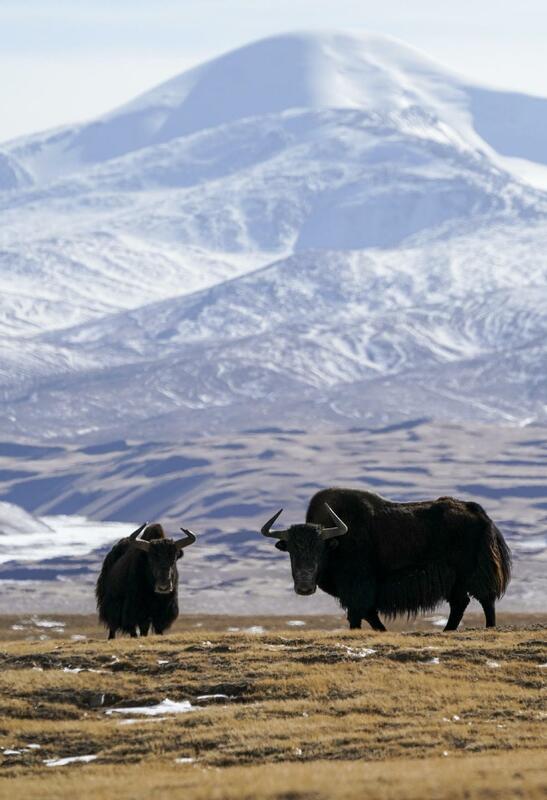 The grassland in Changtang was once a hunting ground for villagers living nearby, but hunting golden yaks have always been off limits. Legend says they were the dowry of the Snow Mountain goddess. During the 1980s, the lives of local residents were improved as more sustenance options became available. As a result, hunting became obsolete. In 1990, China adopted a law to protect wildlife, banning hunting across the country. Poaching, however, threatened wildlife as well as rangers. Phurchung recalled his encounters with armed poachers. Once, he had a gun held against his chest, but he chose to stay there until the poachers ran away. He also helped local forest police catch several poaching groups. The largest one had more than 20 members. "Protecting them is something worth my life," Phurchung said. His son-in-law works at another station located inside a habitat of the endangered Tibetan antelope. Thanks to harsh punishment, the number of poaching cases has been declining. On the other hand, wildlife continues to prosper in the reserve. "We have 60,000 Tibetan antelopes and 15,000 Tibetan wild donkeys - much more than we had 20 years ago. The number of golden yaks is also increasing," local forest police chief Champa Tsering said. Villagers were advised to resettle in areas with lower altitudes. Fences on animal migration routes were removed, and herdsmen who raised fewer livestock were given compensation from the government. A total of 780 farmers and herdsmen were hired as wildlife rangers in the reserve. Phurchung insisted on staying, even though he could have retired when he turned 45. "I still have lots to do and teach the newcomers," he said. "As long as I can walk, I'm still the guardian of this land."